MLLP members travelled to the European Parliament in Brussels on 4 September to make a presentation on our most recent technology for multilingual real-time speech-to-text. 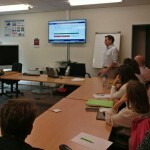 See here our demo videos. 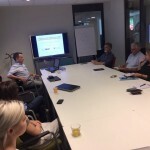 MLLP director Alfons Juan was invited to give a talk about the MLLP’s recent work on automatic multilingual subtitling of video lectures at the Open Universiteit Nederland on 20 July. Read here more about it. 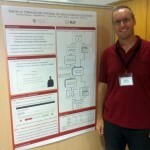 The MLLP’s Jorge Civera presented at IN-RED 2017, the 3rd Spanish National Conference on Educational Innovation and Online Teaching (València, 13–14 July 2017), our group’s work on voice-to-voice translation of video lectures. 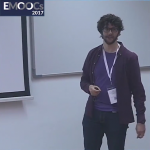 The MLLP presented their recent work and the UPV poliTrans service for automatic multilingual subtitling at the European MOOCs Stakeholders Summit EMOOCs 2017 (Leganés, Spain, 22–26 May 2017). Read here all about it, and watch the video of the presentation if you missed it!